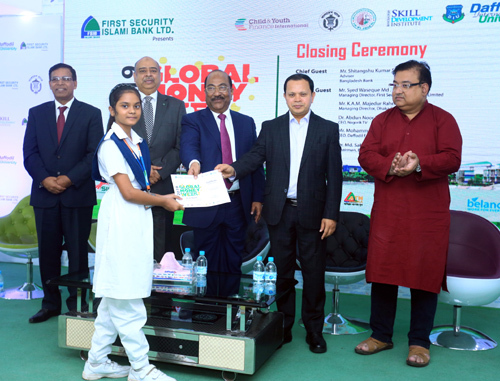 Adviser of Bangladesh Bank Mr. S K Sur Chowdhury distributing award to a winner of the event held to mark the Global Money Week-2019 jointly organized by Daffodil International University and Bangladesh Skill Development Institute in collaboration with Bangladesh Bank and First Security Islam Bank Ltd.
Week long celebration of Global Money Week 2019 has ended today on 31st March at 71 Milonayoton of Daffodil International University with a grand gathering of Bankers, Entrepreneurs, and Leaders. Based on the theme of “Save learn Earn” like other 137 countries of the World, Global Money Week has been observed from March 24-31 in Bangladesh. The weeklong celebration has been designed with different events led by Daffodil International University and Bangladesh Skill Development Institute where the Chief Patron of the event is Bangladesh Bank and sponsored by First Security Islami Bank Ltd.
Mr. S K Sur Chowdhury, Adviser, Bangladesh Bank was present in the grand gathering of the closing ceremony as the chief guest while Mr. Syed Waseq Mohammad Ali, Managing Director, First Security Islami Bank Ltd. Mr. K A M Majedur Rahman, Managing Director, Dhaka Stock Exchange Ltd. Dr. Abdun Noor Tushar, Chief Executive Officer. Nagorik Television were present as the special guests, Dr. Md. Sabur Khan, Chairman, Daffodil Family and Board of Trustees of Daffodil International University presided over the program. 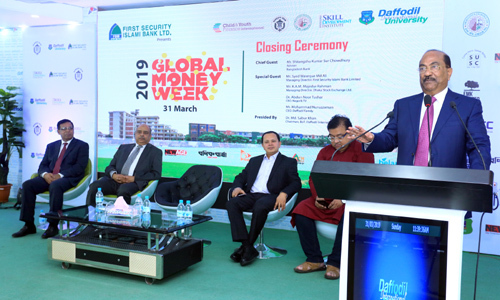 Adviser of Bangladesh Bank Mr. S K Sur Chowdhury addressing as the chief guest at the closing ceremony of Global Money Week-2019 jointly organized by Daffodil International University and Bangladesh Skill Development Institute in collaboration with Bangladesh Bank and First Security Islam Bank Ltd.
Ms. Faria Khan, Ambassador, CYFI and Ms. Amena Hassan Ana, President, CYFI Bangladesh Chapter were present as special guests. Mr. K m Hassan Ripon, Convener, Global Money Week 2019 & Ambassador, CYFI conducted the program. The celebration program covers, Talk session, Master Class, Panel Discussion, Money Museum Visit, Selfie Challenge, essay writing competition and so on. 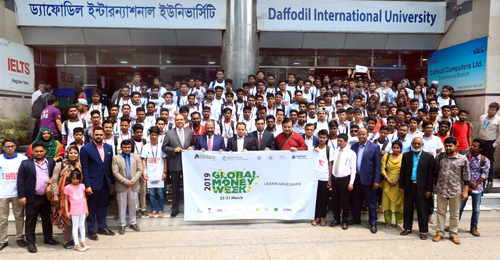 Addressing as chief guest Bangladesh Bank Adviser Mr. S K Sur Chowdhury said, the main purpose of celebration of Global Money Week is to create awareness about banking system and money saving matters among the young generation from their early age. Daffodil International University is arranging this program successfully for the last few years in Bangladesh and in 2017 Bangladesh became champion beating 190 countruies of the world which is praise worthy, he added. He also said that to reduce the poverty and inequality problem of Bangladesh we have to increase saving mentality. Bangladesh Bank and other financial institutes are doing good job regarding this issue. School Banking and mobile banking has been made revolution in Bangladesh. Recently we have 18 lacs school banking account which deposited Tk. 1500 cre . It’s really wondrous! Many other countries followed our mobile banking system, he added. Mr. Mr. S K Sur Chowdhury also said, Global Money Week is a movement. We have to include other universities, NGO, financial organization to enhance mobility of this movement. If we work collectively, success will come very soon. Dr. Md. Sabur Khan said that knowledge is the source of earning money. So you have to invest your knowledge for earning money. He said to the students, world is changing rapidly and almost all the young students have a smart phone . Nowadays world economic system has gone under the system of digital currency. He urged the students to make their career plan as per the changes of world utilizing technological advancement through best use of our social network, he added. Addressing as special guest Managing Director of First Security Islami Bank Ltd. Mr. Syed Waseq Mohammad Ali said, Bangladesh is going to be a middle income country by the year 2021 and developed country in 2041 and Economy of Bangladesh has reached this condition by the contribution of young generation. Our young people are so much potential. They are changing banking sector. He gave example of school banking and said, the success of school banking is unprecedented. If banks are doing their job with organized way, success will come sharply, he added.